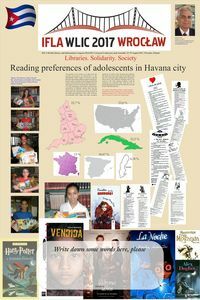 GUERRA PENSADO, Adrian (2017) Readings preferences of adolescents in Havana city. Paper presented at: IFLA WLIC 2017 – Wrocław, Poland – Libraries. Solidarity. Society. in Session 112 - Poster Sessions. 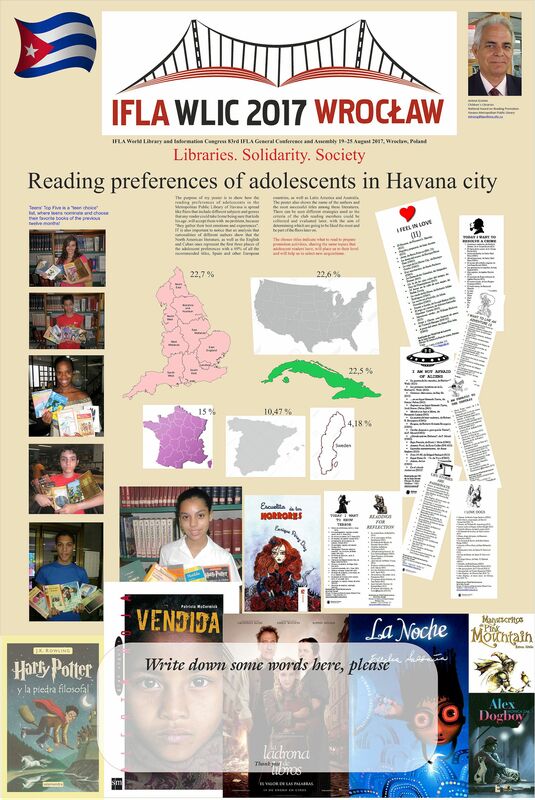 The purpose of my poster is to show how the reading preferences of adolescents in the Metropolitan Public Library of Havana is spread like fliers that include different subjects and genres that any reader could take home being sure that kids his age, accepted them with no problem, because" they gather their best emotions and experiences". IT is also important to notice that the geographical analysis of reading preferences show that the North American literature, as well as the English and Cuban ones represent the first three places of the adolescent preferences with a 69% of all the recommended titles, Spain and other European countries, as well as Latin America and Australia. The poster also shows the name of the authors and the most successful titles among these literature. There can be seen different strategies used so the criteria of the club reading members could be collected and evaluated later, with the aim of determining which are going to be liked the most and be part of the fliers later on. The chosen titles indicate what to read to prepare promotion activities, sharing the same topics that adolescent readers have, will place us to their level and will help us to select new acquisitions.